The darkness of night had spread in the horizon and silence reigned over the face of nature. The time had arrived when the living creatures take rest and sleep so that they might recuperate for their activities on the following day. The Prophet commenced his grand journey from the house of Umme Hani (sister of the Commander of the Faithful) and mounted on Buraq proceeded to Baytul Maqdis, situated in Jerusalem, which is also called Masjidul Aqsa. After a very short time he dismounted there and visited different parts of the mosque as well as Bethlehem which is the birth place of ‘Isa and also saw various other places associated with different Prophets. At some of these places he also performed two rak’ats of prayers. Thereafter he commenced the second part of his journey and proceeded from that place to the skies. He then observed the stars and the system of the world and conversed with the souls of the previous Prophets and also with the angels of the heavens. He saw the centres of blessing and torture (Paradise and Hell) and also saw the places of the dwellers of Hell and Paradise 205 from close quarters, and a consequently became fully aware of the secrets of creation, the extent of the Universe and the signs of the Omnipotent Allah. Then he continued his journey and reached ‘Sidratul-Muntaha’206 and found it fully covered with splendour, magnificence and grandeur. At this time his journey came to an end he returned through the way he had gone. During his return journey also he first came to Baytul Maqdis and then proceeded to Makkah. On the way he met a trading caravan of Quraysh who had lost a camel and were making a search for it. He drank some water from a container of theirs and threw the remainder on the ground and according to another narrative placed a cover on it. It was before daybreak when he dismounted in the house of Umme Hani from the animal which had taken him to the heavens. She was the first person to whom he related this matter and on the day following that night he made it known to the assemblies of Quraysh as well. The story of his ‘ascension’ and grand journey which was considered by Quraysh to be something impossible spread from mouth to mouth in all centres and made the chiefs of Quraysh all the more perplexed. 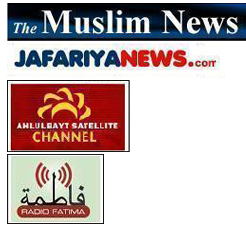 “Even now there are some persons in Makkah who have seen Baytul Maqdis. If what you say is correct then give an account of its structure”. “On my way I met the caravan of such and such tribe who had lost a camel. They had a container full of water which was a part of their equipment. I drank some water from it and then covered it.207 At another place I met a group of persons whose camel had run away and had broken its leg”. “Tell us about the caravan of Quraysh”. “I saw them at Tan’im (a place from where the ‘Haram’ commences). A brown camel was going ahead of them and they had placed a litter on it and are now entering Makkah”. “We shall now come to know about your truth or falsehood”. However, it was not long before Abu Sufyan, the leader of the caravan, appeared and people made known to him in detail what the Prophet had said. Does Me’raj have a Qur’anic Origin? The event of me’raj’ of the Prophet in the heavens has been mentioned clearly in two surahs of the Qur’an and has also been alluded to in other surah(s). We give here briefly the verses which clearly make a mention of me’raj. 1. In order to tell us that the Prophet travelled through these worlds in a short time, not with human strength but through Divine strength, the Almighty commences His statement with “Glory be to Him!” which points to the fact that Allah is free from all defects and needs. He has also not contented Himself with this and has introduced Himself as the Agent of the journey by saying ‘Asra’ (Allah made him perform the journey). This favour was bestowed upon him so that the people might not think that the journey was performed according to natural laws and with usual means, and might, therefore deny its possibility. It has therefore, been clarified that it was undertaken through Divine Will and special favour of the Almighty. 2. This journey was undertaken at night. 3. Notwithstanding the fact that this journey commenced from the house of Umme Hani, daughter of Abu Talib, the Almighty has mentioned its starting-place to be Masjidul Haram. This is perhaps due to the fact that the Arabs consider entire Makkah to be the House of Allah and as such all its places are treated to be ‘Masjid’ and ‘Haram’. Hence, Allah’s saying that: “He made him journey from Masjidul Haram” is perfectly in order. According to some narratives, however, the journey started from Masjidul Haram itself. Although this verse states the starting point of the journey to be ‘Masjidul Haram’ and the end to be Masjidul Aqsa’ there is nothing in it which may be inconsistent with the Prophet’s performing another journey to the heavens, because this verse mentions one part of the journey and the verses of Surah al-Najm deal with the another part of the schedule of the journey. 4. The Prophet performed the journey with his body and soul together and not with his soul only. The words ‘to His servant bear testimony to this, because the word ‘servant’ applies to ‘body with soul’. In case me’raj had been only spiritual the proper words to be used would have been ‘to His servant’s soul’. 5. The object of this grand journey was to make known to the Prophet the various aspects of the existence of the great Universe. We shall elaborate this point later. “Why do you contend with the Prophet about his having seen Jibreel? He beheld him once again near Sidratul Muntaha which is in the proximity of Paradise, which is the abode of good ones. It was when Sidratul Muntaha was covered with grandeur. His eyes did not wander, nor did they turn aside, for he saw some of his Lord’s greatest signs”. One group of the narratives is final and indisputable, for example, the fact of me’raj and some of its particulars. The reports which have been quoted in a correct manner but have not reached the stage of finality, although they conform to the principles and verdict of wisdom, for example, survey of Paradise and Hell, journey in the skies and conversation with the souls of the Prophets. The reports which are not apparently acceptable but are capable of interpretation, for example, the Prophet’s conversation during the night of me’raj with the dwellers of Paradise and Hell which can be explained away by saying that he observed their phantoms, figures and qualities. He uttered these words and did not at all mention ‘salat’ (prayers) or other articles of faith. This in itself shows that prayers had not been made obligatory till then, for, otherwise, mere declaration of faith devoid of a compulsory action like prayers would have been useless. And as regards the fact that he did not mention his own prophethood, it was because witnessing of monotheism implicitly means confirming of his prophethood. Besides this, the historians have also mentioned the embracement of Islam by persons like Tufayl bin ‘Amr Dosi which took place a little earlier than migration (to Madina). At that time, too, the Prophet contented himself with giving them instructions to acknowledge monotheism and his own prophethood but did not mention ‘prayers’. Such incidents go to show that the time of the occurrence of the event in which prayers were made compulsory was only a little earlier than migration. Those who think that me’raj took place earlier than the tenth year of the prophethood of the Prophet are very much mistaken, because from the eighth up to the tenth year he was besieged in the ‘Valley’ and the pitiable condition of the Muslims did not make it expedient that they should have been subjected to an additional responsibility like ‘prayers’. And as regards the years before the eighth, besides the fact that the pressure of Quraysh was so hard on the Muslims that they could not bear additional responsibilities, their number was also very small. At such a time, therefore, when the light of faith and its principles had not been infused in the hearts of an appreciable number of persons it appears very unlikely that an unusual responsibility like prayers should have been imposed on them. As regards the mention made in a number of narratives that Imam Ali, the Commander of the Faithful performed prayers along with the Prophet for three years before the appointment of the latter to the prophetic mission and continued them later, it may be said that it meant special and unlimited prayers and not limited and conditional prayers with a fixed time.211 It is also possible that they might have been ‘recommended’ and ‘nonobligatory’ prayers. Was Me’raj of the Prophet Physical? The quality of me’raj of the Prophet has been a subject of discussion for long and much has been said about its being physical or spiritual, although the Qur’an and the traditions clearly state that it was physical.212 However, some scientific notions have prevented a group of persons from accepting this reality. Consequently they have resorted to their own interpretations and considered the me’raj of the Prophet to be purely spiritual and have said that only his spirit travelled through all the worlds and then returned to his sacred body. Some have gone a step further and say that all these events were a vision and the Prophet saw different places and travelled through them in a dream. The statement of the last group is so much distant from logic and reality that it should not at all be considered as a part of the traditions and opinions relating to me’raj. The reason for this is that when Quraysh heard that Muhammad had claimed that he had travelled through all these places during a night they became very uneasy and got up seriously to give him the lie, so much so that his me’raj became the subject of discussion in all the assemblies of Quraysh. In case his travelling through these worlds had been only a vision there was no point in Quraysh rising up to refute him and to create all the tumult. This is so because if a person says that one night, while asleep, he has dreamt this and that it cannot become an object of dispute and strife, for a dream is after all a dream and many impossible things can be seen in it. For this reason, therefore, this view is not worth further scrutiny. Unfortunately, however, some Egyptain scholars like Farid Wajdi have adopted this idea and supported it with baseless statements. In spite of all this, however, it is only proper to pass it over. Those people who have not been able to solve some minute points related to physical me’raj have been compelled to resort to interpretation and have considered the Prophet’s me’raj to have been a spiritual one. Spiritual me’raj means meditation about the things created by the Almighty and observation of His Grandeur and Beauty and absorption in thoughts about Him and glorifying His name and eventual freedom from material ties and worldly interests and crossing through all possibilities and entering into internal and non-material stages. And after going through all this process a special proximity to Allah is acquired, and it is not possible to define it. If spiritual me’raj means meditation about the Grandeur of the Almighty and the extent of the creation, such a me’raj is undoubtedly not peculiar to the Prophet of Islam as many Prophets and other enlightened and pure-hearted persons have also enjoyed this position, whereas the Qurtan mentions his me’raj as something peculiar to him and an extraordinary distinction for him. Furthermore, the Prophet had been in the aforesaid condition during many nights 213 whereas me’raj has been proved to be related to a particular night. There are two types of bodies in the world, elemental and celestial. An elemental body consists of the four well-known elements (water, earth, air and fire). The first sphere which we observe is the sphere of earth which is the centre of the world. Then come the spheres of water, air and fire and every one of them surrounds the other. Here the spheres come to an end and the celestial bodies begin. Celestial bodies’ means the nine skies which are connected with one another like the layers of an onion and are not at all capable of rending and conciliation and separation and union and no creature can move straight through them, because this would necessitate separation of the components of the sky from one another. The Prophet’s me’raj being physical necessitates that he should ascend from the centre of the world in a straight line and should cross the four spheres and also rend the skies one after the other and the rending and conciliation of the skies is not possible and practicable according to Greek astronomy, the said thinkers have been obliged to consider the Prophet’s me’raj to be only spiritual, as nobody can restrain a spirit from performing a journey. These statements had some worth in those days when Ptolemy’s astronomy had not yet lost its value in scientific circles and some persons sincerely liked it and were inclined to it. In such circumstances it was possible that we might have played with the intricacies of the Qur’an and had explained away the clear verses of the Qur’an as well as the traditions. These hypotheses have, however, lost their all-pervasive value and their baselessness has become evident. Only at times a mention of Ptolemy’s astronomy is made in connection with the history of science. Furthermore, in view of the invention of various astronomical implements and powerful telescopes and descending of Apollos and Lunas on the surface of the moon, Venus and Mars and journeys of the astronauts on the moon have left no ground for these imaginary hypotheses. Nowadays the scientists consider the existence of four elemental spheres and nine inter-connected skies to be a mere myth and have not have not succeeded in seeing, with the help of scientific implements, astronomical tools and well-equipped eyes, the worlds which Ptolemy had created with his imagination and they consider to be valueless even view which is founded on his wrong hypothesis. Nevertheless, the enlightened, truth-seeking and unbiased persons consider this view also to be worthless and opposed to the Qur’an and clear text of the traditions, just like the previous view (the me’raj being spiritual), because, as has already been said, when you place the verse of the Qur’an relating to me’raj before a linguist he will say that the speaker means the worldly elemental body for which the word ‘abd’ (servant) has been used in the Qur’an and not the word ‘Herculian’, because the Arab society was not at all conversant with this and other similar words and in Surah al-Isra’ only the common groups and individuals have been addressed. Now the factor which has prompted him to adopt this forced interpretation is that very Greek myth about the system of existence according to which it is firm like Lawh-i Mehfooz (The Protected Tablet). But now that all the scientists refute this view it is not at all proper that we should continue to follow it blindly. If the scholars of the past have said something on account of their being optimistic about the old astronomy they can be excused and are not much to blame, but it is not proper for us, during the present times, to ignore the Qur’anic realities on account of a hypothesis which has been refuted by the body of scientists. Modern science says: In order to get away from the earth it is necessary to neutralize its gravity. If you fling a ball in the air, the power of gravity brings it back to the earth. With whatever force you fling it, it will come back to the earth again. If we wish to neutralize the gravity of the earth fully, so that the ball should move on and should not return to the earth, it will be necessary to fling at the minimum speed of 25,000 miles per hour. Hence, the Prophet went out of the zone of gravity and became weight-less. But here the question arises as to how he performed the journey at this speed without necessary facilities. The atmosphere in which one may breathe does not exist beyond a few kilometers of the earth. Thereafter, as we go higher, air becomes thinner and still more unfit for breathing and occasionally we reach a point where there is no air at all. How did the Prophet manage to live without oxygen while performing his journey in the aforesaid regions? The mortal rays and celestial stones destroy every terrestrial body which is touched by them. They do not, however, reach the earth on account of their collision with the regions of air and in fact these regions serve as a coat-of-mail for the inhabitants of earth. In the circumstances, by what means did the Prophet remain safe from these mortal rays? Human life is deranged as and when the pressure of air increases or decreases and man can live in only a particular pressure of the air which does not exist in the upper regions. The speed at which the Prophet performed his journey was decidedly more than the speed of light. Light travels at the speed of 300,000 kilometers per second and modern science has proved that no body can travel at a higher speed than that of light. Keeping this scientific law in view, how did the Prophet commence his journey at a speed higher than that of light and then returned safe and sound? These scientific and technical developments clearly show that such an activity is hundred per cent possible and is not something beyond reason. It is possible that some persons may argue that such a journey cannot be undertaken without scientific and mechanical implements and as the Prophet did not possess these resources during the night of me’raj how could he travel in such worlds without them? Reply to this statement becomes quite clear from our foregoing discussions about the miracles of the Prophets and especially from the detailed narrative which we have penned earlier about the events of the ‘Year of the Elephant’ and the incident of Abrahah’s army being killed with small stones, for it is an established fact that the things which ordinary persons do with implements and scientific tools can be done by the Prophets with the blessings of Allah, and without any apparent and external means. Prophet of Islam went to me’raj with the blessing of Almighty Allah to Whom the entire creation belongs and Who is the Creator of this wonderful system. It is He who has given gravity to the earth and cosmic rays to the sun, and has created different layers in the atmosphere. And He can take these things back and control them whenever He likes. In case the schedule of the historical journey of the Prophet was accomplished under the command of Allah all these laws decidedly surrender before His absolute Will and are in the grip of His power every moment. In the circumstances what difficulty should there be if the Lord who has given gravity to the earth and cosmic rays to the heavenly bodies should take His chosen servant out of the centre of gravity with His unlimited power and without any apparent means? Allah who has created oxygen can certainly create air for His chosen Prophet in the areas where air does not exist. The efficacy of a miracle is basically different from that of the natural causes and the strength of man. We should not consider the strength of Allah limited like our own. If we cannot perform a job without means we should not say that the Omnipotent Allah cannot also perform it. From the point of view of difficulty and its solution the bringing to life of the dead, the transformation of a rod into a boa and keeping Prophet Yunus alive in the belly of a fish in the depth of the sea-the events which have been confirmed by the Heavenly Books and have been narrated for us-are not unlike the me’raj of the Prophet of Islam. In short all the natural causes and external impediments are controlled and conquered by the Will of Allah. His Will does not concern only that which is an impossibility, but besides that He can do whatever He likes, whether or not man possesses strength for it or not. No doubt we are addressing here those people who recognize Allah with the qualities and attributes which are peculiar to Him and who believe that He is Omnipotent and can do whatever He wills. “He made him ascend so that he might become aware of the expanse of the Universe and see and hear wonderful things, the like of which had not been seen and heard by the eyes and ears before”. It is no doubt necessary that the last Prophet should enjoy such a position that he should rely on his vast information and should be able to send a message to the people of the 20th century, who are still thinking of travelling to the moon and to Mars, that he did this performance without any means and his Creator was kind to him and made him fully aware of the system of creation. 205. Majma’ul Bayan Surah Bani Isra’il, 17:1, vol. III, page 395. 206. For understanding fully the meaning of ‘Sidratul Muntaha’ refer to books of exegeses. 207. Some narrators have quoted thus: “I dropped the remainder”. Possibly the difference between the two versions is due to the action having been repeated. 208. For further details the readers are advised to refer to the chapters on ‘Ascension’ of Biharul Anwar, vol. XVIII, pp 282 – 410 and of Tafsir-i Burhan, vol. II, pp. 390 – 404. 209. Majma’ul Bayan, vol. III, page 395. 210. Seerah-i Ibn Hisham, vol. II, page 27. 211. For further information regarding the time when wuzu, prayers and call to prayers were made obligatory please refer to Furu’-i Kafi, vol. I, p. 135. 212. The great Shi’ah jurist, the late Shaykh Tabrasi, has stated in Tafsir-i Majma’ul Bayan that all Shi’ah scholars are unanimous that the ‘Me’raj’ was physical, vol. III, page 395. 213. Wasa’il, Book of Fasting, chapter-prohibition of fasting. 214. Barzakhi body is like the body with which man performs all deeds in a dream. 215. The pamphlet entitled ‘Qatifiyah’ is one of his 92 pamphlets which were published collectively in 1273 with the name of “Jawame’ul Kalim”. The text of his remarks is as under: “In the event of ascension as the body goes above it abandons the elements connected with every one of the spheres at that very place and moves on. For example, it leaves the element of air in the sphere of air and that of fire in the sphere of fire. And at the time of its return it regains all that it had abandoned”. Hence, at the time of ‘Me’raj’, the Prophet abandoned every one of the four elements of his body (in the past the basic elements were considered to be four) in their respective spheres and went for me’raj with a body which was devoid of these elements. Such a body cannot be an elemental body and can be nothing else than ‘barzakhi’ (according to his terminology a ‘Herculian’ body). In the book entitled ‘Sharh-i Ziarat (pages 28 – 29) the Shaykh states that the nine skies are not capable of rending and conciliation? 216. After artificial moons had been sent in the space, a twenty seven year-old Russian named Major Gagarin first commenced his journey into space in a space ship on Wednesday, 12th April 1961. He was the first human being to undertake such a journey. His spaceship went 302 kilometers above the earth and he travelled round the earth for one hour and thirty minutes. Thereafter spaceships were sent into space by America as well as by the Soviet Union. Eventually Apollo-12 with all its occupants landed on the moon and it was for the first time that man set his foot on it. This schedule has been put to test a number of times thereafter and has been usually successful. All these activities go to show that landing of man on the surface of the spheres is possible. And the thing which man does by scientific methods is done by his Creator by means of His Great Will.